From the first seconds of the first trailer I knew this film was one I had to see. The three main cast members alone were enough to hook me: Frances McDormand, Woody Harrelson and Sam Rockwell? What’s not to like with a cast like that? Not to mention the look of sheer determination of will on McDormand’s face throughout; I certainly wouldn’t dream of messing with her. I could barely tell what the film, as a whole, was about based on this minor glimpse therein, but it didn’t matter. What mattered is that I see this film as soon as the opportunity presented itself. Between the time that the film first burst on to my radar and when I saw it, my anticipation grew exponentially. The biggest jump in my excitement came when learning who wrote and directed it. Martin McDonagh, the writer/director behind In Bruges and Seven Psychopaths was the mind behind Three Billboards as well. Although not having many credits to his name thus far, with only three features and eight credits total, McDonagh has proven he is a master when it comes to writing relatable, yet seriously flawed, characters, as well as generally delightful dark comedies. 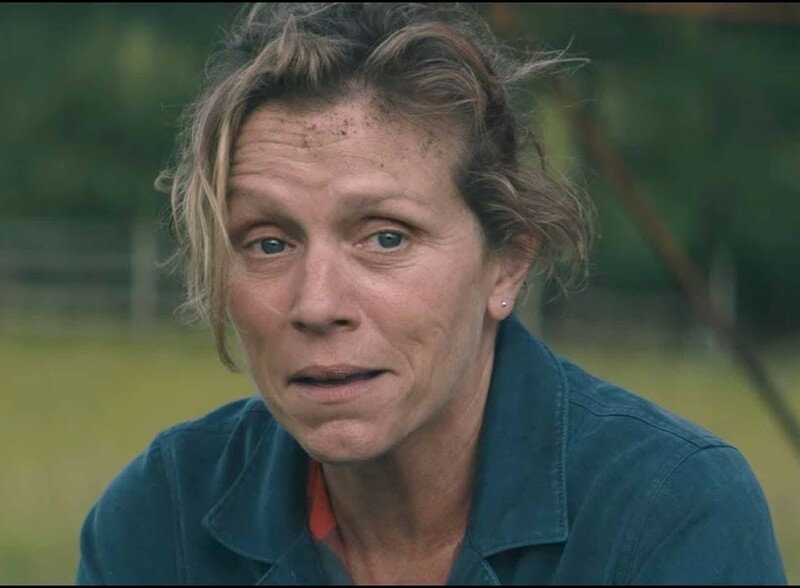 That pain and bravery is captivated perfectly by Frances McDormand, who plays the main character, Mildred. Mildred, who recently lost her daughter in a particularly violent crime, is beyond upset with the way the local police have handled the case. Frustrated with the lack of progress, she puts up three billboards calling the police out directly, much to the annoyance of other townsfolk. The film is deep and dark as parts of the ocean, but has a good bit of humor mixed in. McDonagh says in an interview that, for the most part, he sees the world in a “darkly comedic way,” and that he tried to write the film with a strong element of humanity and hope, not just tragedy and despair. And he succeeds. But I’m not sure he would’ve pulled it off so brilliantly without the help of the actors he wrote the main two roles for. McDonagh has said in several interviews that he had Frances McDormand and Sam Rockwell “in his head” as he wrote the characters of Mildred and Dixon, hearing them say the lines as he wrote, and seeing their mannerisms. What we’re given through this effort are the most commanding performances ever given by McDormand and Rockwell. 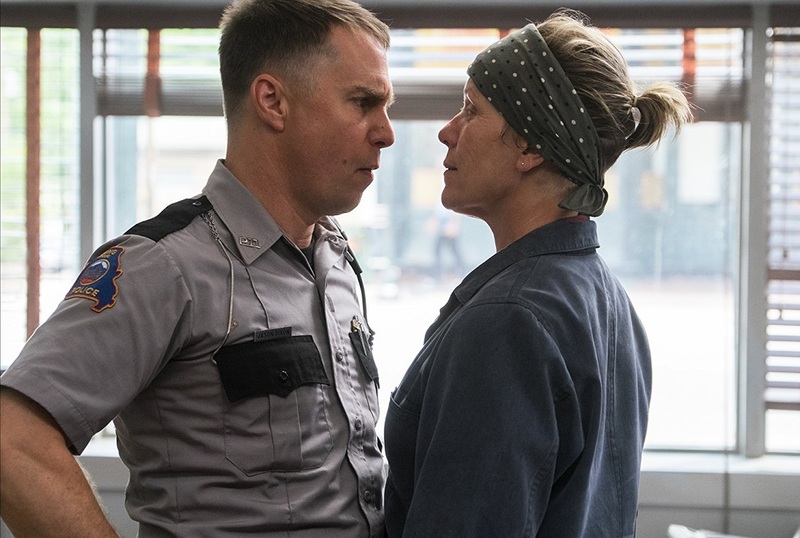 McDormand, who barely smiles throughout Three Billboards, plays a woman who pushes grief aside and lets the anger and rage of her situation take over in the name of justice. Rockwell, in contrast, plays a goofy, racist, dimwit, who by the end of the film changes profoundly and wants to correct the error of his ways. The end result of McDonagh’s focus and creativity is a film that is more than worthy of the over 180 nominations it’s received thus far (and counting). Three Billboards Outside Ebbing, Missouri is a heartbreaking look into one mother’s sorrow, and the sheer grit and determination she has to see that justice is served, no matter the cost. It’s a captivating take on the anguish and bitterness that is capable of engulfing an entire town when a single life is lost. And although the ending leaves more questions than answers, this is one film that is no less satisfying. 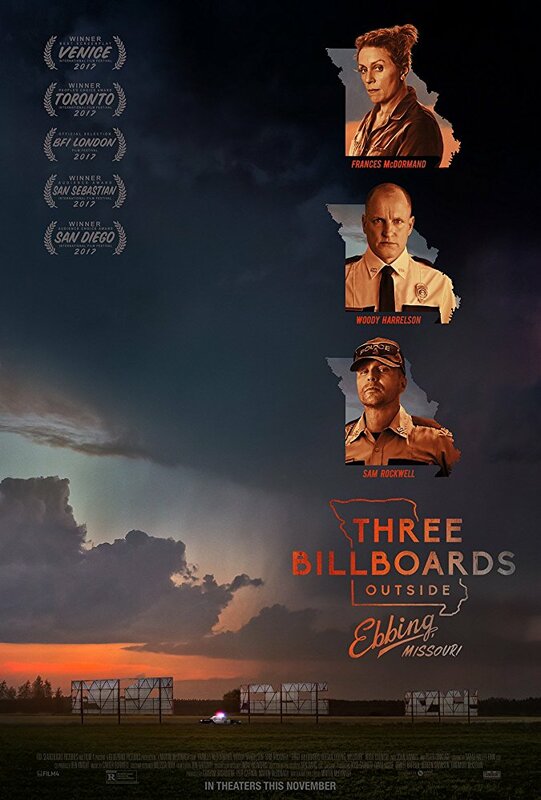 Three Billboards Outside Ebbing, Missouri is rated R, was written and directed by Martin McDonagh and stars Frances McDormand, Sam Rockwell, Woody Harrelson, Peter Dinklage and John Hawkes. It is currently still in theaters, and will be available on Blu Ray, DVD and streaming on February 27.